Applying for a loan can feel like an invasion of your privacy. As if lenders want to pull back the curtain on your life and analyze every detail, including your job, your income from that job, your tax returns, and, worst of all, copies of your asset statements. You want to ask them what they’re looking for and why! Well, many borrowers do ask that question and with good reason. When strangers dig around in your personal life, it feels invasive. When they dig even deeper, asking questions about the documents you’ve provided, it’s frustrating and confusing. In this post, I’m going to talk about one set of documents you’re required to provide when you apply for a loan: your asset statements. 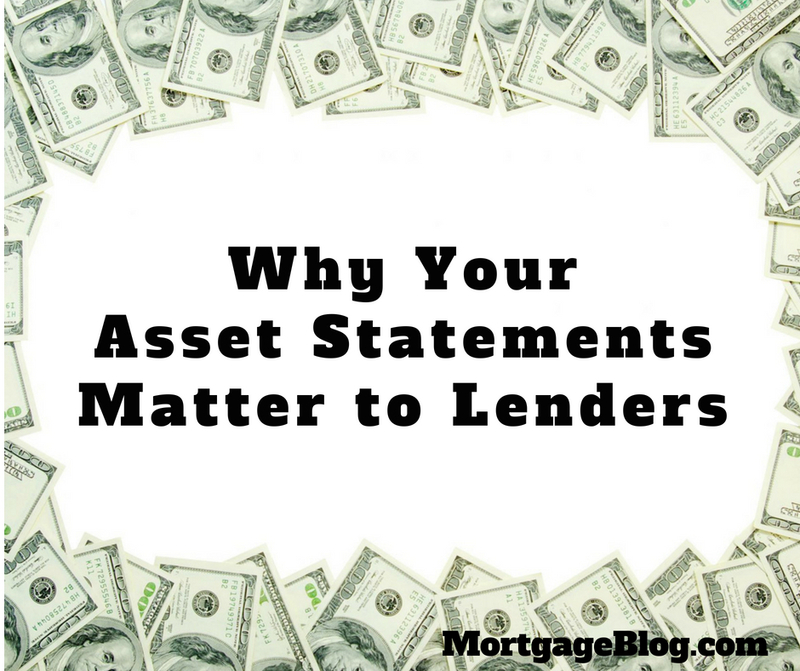 Going over why the statements are necessary and what lenders look for may not make you feel right about it, but at least you’ll know the method behind their madness, aka the reason why. Prove your ability to save money. Note: You don’t have to list every account you own. If you’re not planning to use some accounts to buy your home, they don’t need to be included on the application unless you transfer money between these accounts and the accounts listed on the application. We’ll get back to that later in the article, but for now, let’s focus on what lenders look for on your asset statements. To make sure you have the money needed to complete your purchase. To document where that money came from – the source. Making sure you have the money to complete the transaction, known as “cash to close,” happens at the beginning of the loan process. You should have all the funds when you apply, or be able to detail where the funds will be originating. If part of your cash to close is a gift from a family member or a bonus or commission you expect before closing, communicate the details to the lender upfront. The rest of the money should already be in your accounts. The lender will review where your money came from, known as ‘Sourcing.’ Bank statements typically identify the source of all deposits on the statement, with few exceptions. When your paycheck is direct deposited into your account, your employer is identified as the source on the statements. If you have generic deposits from multiple checks and cash, the statements won’t be enough to prove the source of the money. You can provide copies of the item(s) that make up a generic deposit when you give your lender the statements or wait for them to request the documents. Note that in most cases, you’ll only need to source deposits that represent more than 25% of your monthly qualifying income. When you apply for a mortgage, cash is definitely not king. It’s not uncommon to have some money you’ve accumulated as a ‘rainy day fund’ or received by selling small items in the form of cash. Unfortunately, there’s no easy way to document the source of cash deposits, and without documentation, they’re not allowed to be used in a loan transaction, no matter the source. Even identified deposits on a statement can trigger a sourcing request from an underwriter. If the deposit is unusually large compared to the accounts’ average balance and regular deposits, source documentation, along with a written explanation, will be required. Questions may also come up if the underwriter notes regular payments made out of one of your accounts. If these are payments for debts not listed on your application or credit report, they’re known as undisclosed debt. Don’t panic; this isn’t necessarily a bad thing. It’s probably a revolving or installment loan recently opened that you assumed would show on your credit report. The remedy is to document the new debt with a statement from the creditor along with a brief explanation. Lenders also review statements to confirm you’re the owner of the account. If you’re not the only owner on an account, and the other party is not a part of the loan application, you need their written permission to use the funds in the account. The ‘access letter,’ as it’s called, must state that you have access to 100% of the funds in the account, to use the entire balance. The final detail underwriters look for are overdrafts. While an overdraft won’t necessarily equal an automatic decline of your loan request, it presents a significant hurdle. Be prepared to explain how and why it occurred and provide supporting documentation. Lenders view overdrafts as evidence of poor money management on your part, and that’s a negative when applying for what is most likely your most substantial debt. Much of the asset statement review process is required as lenders comply with federal laws covering Anti-money Laundering, and the Patriot Act. After a loan has funded, the file is audited for compliance with these laws. And these laws are behind some exasperating documentation requests when a borrower makes a regular practice of shifting money from one account to another. If you have accounts you’re not planning on using for your cash to close, but you move money between those accounts and ones you’re using – you’ll be asked to provide two months statements for those accounts. The lender will need them to source deposits and withdrawals between the accounts, and to confirm you own the account not disclosed initially. You can reduce your documentation requirements by not transferring money from any accounts you don’t plan on using into those you will be using for cash to close. Knowing what lenders look for, and why, allows you to plan before you apply for a mortgage, and, be prepared once you do.